It’s been a week since the 2017 Tokyo Motor Show kicked off, and the public days run through this weekend. Japan’s biggest car show is expected to have more than 800,000 visitors this year. You should go some time! If you happen to be in town this weekend, here’s the coolest stuff you should see. The show, to begin with, is huge, occupying the entire Tokyo Big Sight convention center. Toyota and its subsidiary Daihatsu had the entire West Halls, showing the might and dominance of Japan’s largest auto manufacturer. Volvo, Citroën, Harley-Davidson and the Gran Turismo games shared lobby space of the West Hall. On the East Halls, local and overseas manufacturers share space while Honda, Suzuki, and Yamaha had the halls at the far end of the Big Sight. This year’s show was a mixed bag. Tokyo is known for its concepts rather than big and important new car unveilings, so in that regard it stayed true to tradition. Still, everyone was kind of expecting a new Toyota Supra or something similarly big. That didn’t happen. All of which meant that everything was sort of predictable, almost as if automakers were playing it safe this year to keep everyone happy in light of a few recent scandals. Some of the new things? Autonomous electric concepts, for one, which were all the rage, with everyone from Toyota, Nissan, Honda, and even Mitsubishi hopping aboard the future train. Mazda and Subaru, meanwhile, continued to play their strengths as enthusiasts’ favorites by showing the world that internal combustion engines still have a place in their futures. Apart from a few new car launches, though, the highlights were all the concepts. Most of the concepts are probably irrelevant to overseas markets, though manufacturers might still incorporate some of the clever technology in the concepts to future production cars. 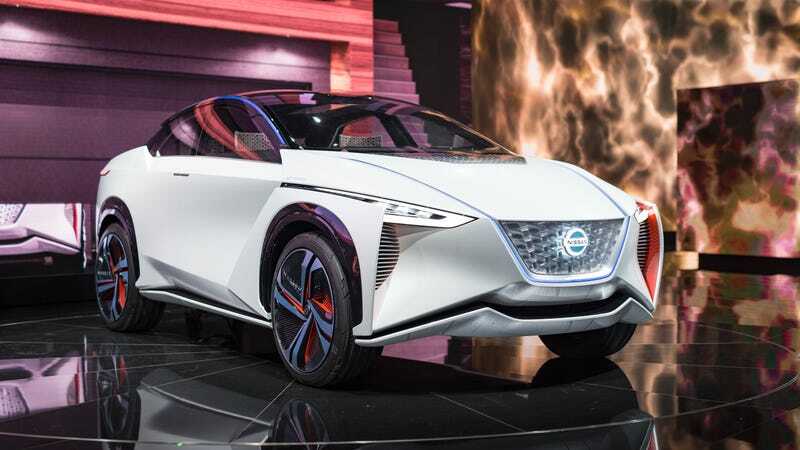 Autonomous technology, just like EVs, was also hard to escape, with Japan’s biggest car companies showing their interest in developing the technology for mass-market making it only all the more inevitable. Some of my favorites, across the show: Mazda’s stand, in particular, with both the Vision Coupe Concept and the Kai Concept on display. Subaru also showed what the next-generation WRX could look like with the Viziv Concept, though I wouldn’t get too excited considering Subaru’s history with concept cars. Lexus, for their part, showed the LS+ Concept, another autonomous car taking the LS sedan to a new level. Honda had the Sports EV Concept, a two-door EV coupe to compliment the retro-cool Urban EV Concept from the Frankfurt Motor Show. Nissan and Mitsubishi showed similarly sized autonomous EV SUVs. A coincidence, perhaps but maybe a sign of the close relationship the two companies will have in the future with technology and platform sharing after Renault-Nissan’s buyout of Mitsubishi Motors. Then there was Toyota. They had several concept cars on their stand, including the Concept-i which actually debuted at CES earlier this year. The Fine-Comfort Ride Concept was a new concept signifying Toyota’s commitment to fuel-cell vehicles. Toyota also showed the GR HV-Sports Concept, a hybrid targa-top concept based on the Toyota 86. The styling is like a mixture of a Lamborghini Veneno, Toyota MR-2 222D Prototype, and maybe a bit of Supra too; the car’s H-pattern automatic was the talking point of the show. Toyota’s only new road car debut was the third-generation Century. It attracted a lot attention and rightfully so. I think they got this car right, combining the traditional old-school looks of the Century with modern touches. What wasn’t on the Toyota stand? The Supra, of course. It might have been optimistic to expect a new Supra at Tokyo this year, as it’s being engineered by Toyota’s Gazzo Racing division in Europe, but BMW had their Z4 Concept at the Motor Show too. That, though, was the closest we got to Supra glory. For overseas manufacturers, it was a chance to show the Japanese public some of their latest cars for the first time. BMW’s latest concepts, the aforementioned Z4 Concept and the 8-Series Concept, have been doing rounds at various auto shows around the world, but, for the first time, landed in Japan alongside the new M5. Alpina debuted the D5 sedan and B5 Touring, one of my favorites from the show. In a show dominated by white and grey autonomous vehicles, a blue 600 horsepower wagon stands out. Porsche showed off its new generation Cayenne (I promise it’s a new one) and the Panamera Sport Turismo wagon. They also had a rather lovely 356 Speedster, fairly randomly. Next to Porsche, Volkswagen were still showing TDI cars. Japan has been slow at adopting so-called clean diesel cars but VW are still sticking with it here. Mercedes-Benz, meanwhile, went all out, with a massive stand that, it should be noted, was directly opposite BMW’s, and featured bright flashing lights and loud music. 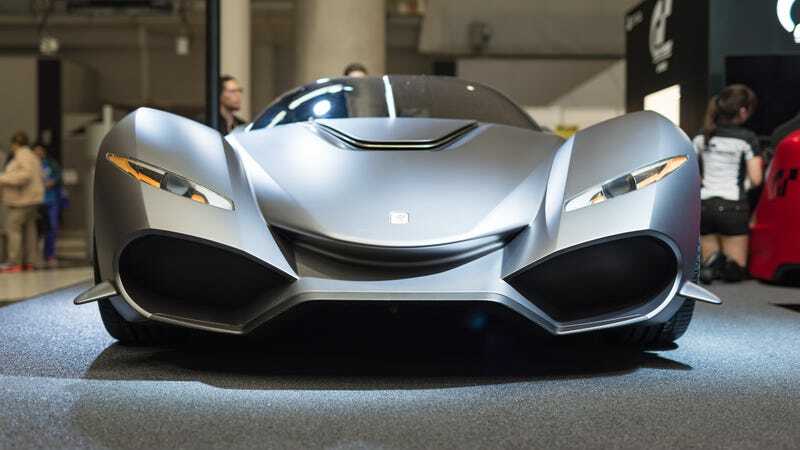 Taking center stage was the Project 1 hypercar, powered by a F1-derived 1.6-litre twin-turbo V6 hybrid system. For some reason I wasn’t blown away with it, though I’m sure it’ll be an engineering tech fest and an absolute monster around a track. It just seemed like Mercedes could’ve done better with the design. It looked too much like a sad fish for my liking. Some manufacturers that weren’t there? Jaguar Land Rover, Fiat Chrysler, GM, McLaren, Ferrari, and Lamborghini all didn’t make an appearance at the show. I also assumed Nissan would take this opportunity to launch the Infiniti Q60 Coupe in Japan. Rumors suggest it’ll be sold as a Nissan Skyline Coupe to signify its relationship with the Skyline sedan (Inifniti Q50) as the Infiniti brand isn’t sold in Japan. And it wouldn’t be a complete Tokyo Motor Show experience without some obscure cars. Yamaha, famous for their motorbikes and musical instruments, showed a concept truck perfect for carrying bikes and featured “diamond seating.” A four-seater with a central driving position, two seats either side of the driver, and a seat behind the drive in the rear. Daihatsu brought along an entire new range of “DN” concept cars ranging from a minivan, a SUV, and a four-door coupe. Whether or not these concepts will make it to production is unclear, but if they do will be only be sold domestically. And then there’s the Ikeya Formula IF-02RDS (catchy name), which was dubbed the “ultimate road going sports car” by the company. Known for making parts and metalwork of motor racing, Ikeya’s first foray into road cars isn’t half-assed. The car comes with their patented 5-speed “seamless transmission” and a 2.0-liter Honda engine with 300-340 HP. The company are looking to replace this with an in-house engineered 4.0-liter naturally-aspirated V10 when it goes into production. They’re estimating a 610 HP output from that, which would be a riot in a car weighing just 2,500 pounds. Finally, there’s the IsoRivolta Vision Gran Turismo by Zagato. These video-game-to-reality concepts keep getting more and more ridiculous. Word is Zagato will build three to five of these based on a Corvette Callaway, for anyone wanting to drive Gran Turismo in real life. Yes, the design is as weird and unfathomable as it looks in photos. It was great to see the enthusiasm of the public at the show. There were more kids than I expected, though most of the attendees were middle-aged men in suits. But everyone looked excited and happy to be there, several sitting in various cars. The Mercedes-AMG, Toyota stand, and Honda EVs were definitely the most popular, with rows of people fighting to get photos. All of which is no surprise: Japan’s biggest motor show only happens once every two years. There was even a line to get official TMS 2017 merchandise. And yet, for all the grown-up and proper atmosphere of the Tokyo Motor Show, I’m very much looking forward to the craziness that is the Tokyo Auto Salon. Just a couple more months to go.